From time to time, I hear from non-polish companies, and most of the time, I don't do posts about them. I like to keep this blog very nail-centric for your reading pleasure. 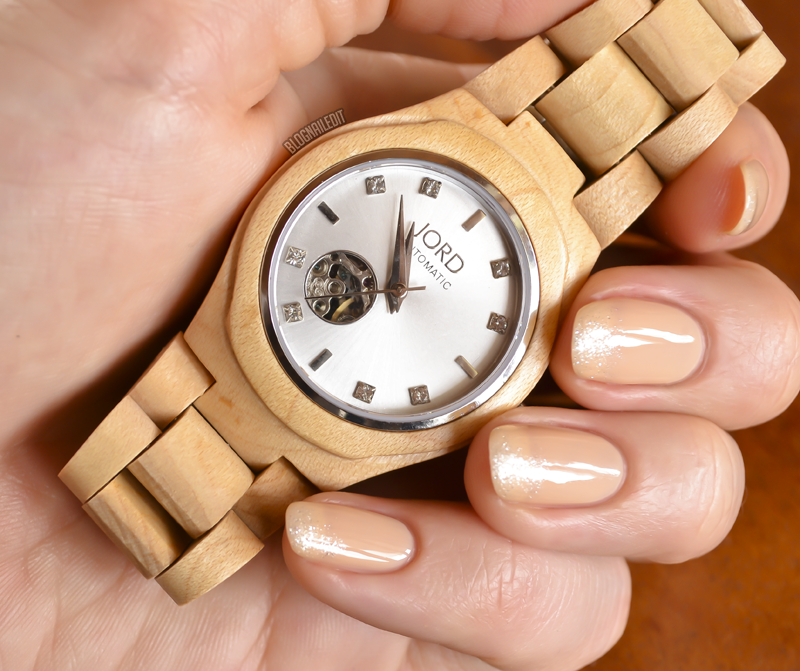 With that in mind though, I'd like you to check out tonight's post, because it features both nails and a beautiful watch from the wood watch company, Jord. 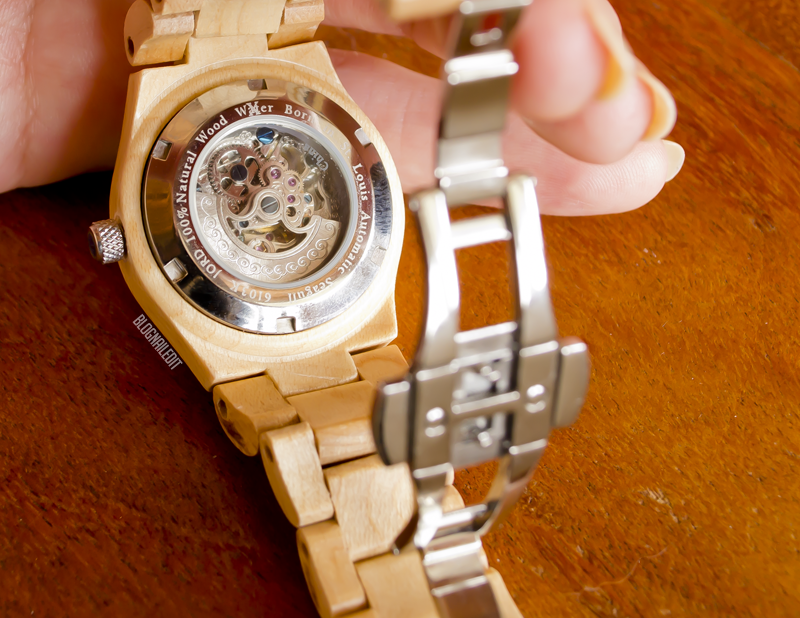 Jord designs simple and modern wooden watches, with a unique sense of style behind each piece. I've seen wooden watches on Pinterest, and thought that they provided the perfect blend of functionality and style, without the traditional industrial look of other watches. While my nails often scream "Look at me! ", my personal style is much more reserved. I'm a tunic-wearing, legging-loving, boot-rocking kind of girl, and I think this beautiful Jord watch complements my style very well. The beauty of the watch is that it can easily be dressed up. By pairing it with this rhinestone bracelet and a little glitter on my nails, it's gone from a casual clock to a tricked-out timepiece. I used Azature White (from Azature) over Coney Island Cotton Candy (from OPI). And do you see the little peep hole on the face of the watch? You can actually see the gears working through that, as well as on the back of the watch. 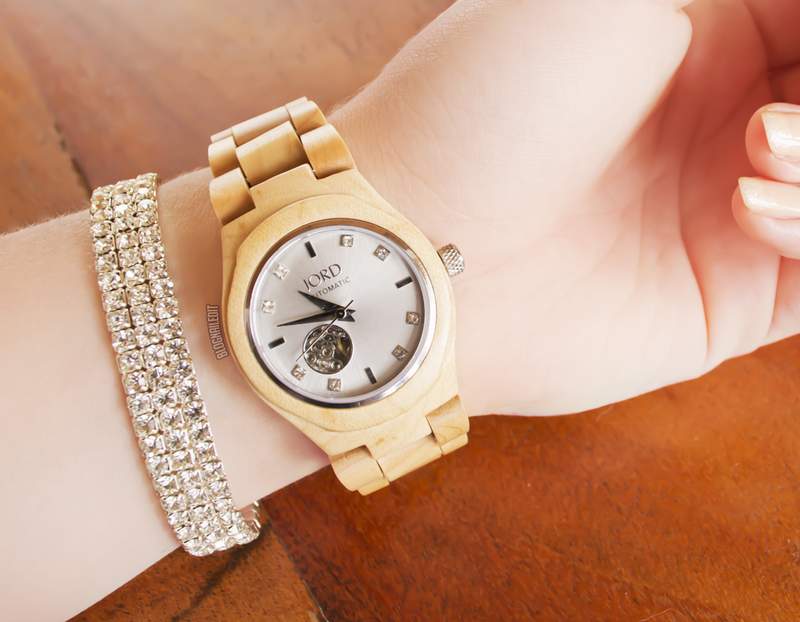 I want to thank the generous members of Jord for sending me the Cora Series watch, in Maple and Silver. After wearing it out one night, I can assure you it's a beautiful conversation starter. My friends noticed it immediately, and boys and girls alike were asking me where I got it. Visit their online shop to see the rest of the models, including unisex, men's and women's watches. I really love mine! Such an unique and classy looking watch! Lovely post! That watch is gorgeous!